As the fall sports season gets into full swing, the incidence of football injuries increases. While some injuries can be prevented by warming up, cross-training, and practicing good technique, almost every athlete will experience at least one injury during their career. If that injury happens this season, it’s a good idea to be prepared with knowledge about how to recover from football injuries so you will be ready. Quick pivoting can cause damage to the ligaments and muscle surrounding the knee joint, leading to ACL, MCL, or meniscus tears. Suddenly changing direction while running or getting tackled can cause an ankle fracture or damage to the many joints and tissues in the ankle. Impacts from tackling or diving can cause shoulder dislocation or separation. 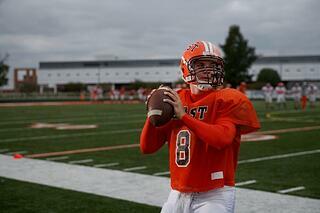 Quarterbacks can also experience repetitive use injuries such as tendinitis or bursitis. Pulling or tearing a hamstring is common among football players as a result of performing explosive movements when the body is not properly warmed up. Contusions can also be caused by the impact of tackling. Ligament sprains and muscle strains happen to all types of athletes. In football players, these mostly occur in the lower extremities, but can also be found in the wrist, elbow, or shoulder. The process for recovering from an injury depends on how severe it is. In extreme cases, surgery might be required to repair torn tissues or fractured bones. However, in many cases, recovery includes a combination of RICE (rest, ice, compression, elevation) therapy, pain medication, and possibly physical therapy. Perhaps the oldest sports injury treatment method available, RICE therapy relies on resting the injured area, icing it to reduce pain, applying compression to reduce swelling, and elevating the area to prevent the build-up of edema. Both prescription and over-the-counter medications are available to reduce the pain caused by the injury. Using an NSAID may also help reduce swelling at the same time. Injuries that require regaining muscle strength and flexibility might require physical therapy. This is often the case after surgery or a significant ligament tear. Almost any type of injury can benefit from these approaches, but if you believe that it is anything more than a sprain or strain, it’s a good idea to consult with a physician. Cold therapy systems also provide convenient, hands-free treatment so injured athletes can work, study, or play video games while the device does all the work. Injuries are an unfortunate reality for football players, but the more prepared you are to go through the recovery process and avoid common mistakes, the faster you can get back in the game. If you or your child have suffered a football injury, download our free e-book How to Recover Faster from the Most Common Football Injuries.